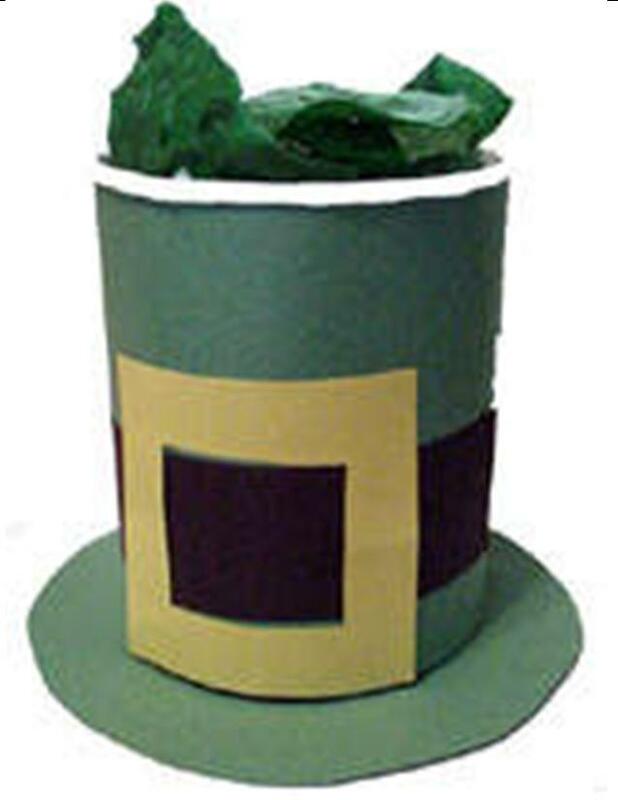 We recommend kaboose.com for Saint Patrick’s Day activities. There are recipes for traditional corned beef and cabbage, Irish soda bread, and plenty of fun projects. Here’s one we like. [This is] a fun table decoration that can be used to hold chips. We found green tortilla chips at our local grocery store. You can use regular tortilla chips and then tint your dip with green food color. Whatever you do, have fun! 1. Trace around the large circular object on the green construction paper with the pen. 3. Use the double stick tape to adhere the circle to the bottom of the ice cream container. 4. Cut a piece of green construction paper to fit around the container. You may need two pieces of construction paper or be able to piece them together. 5. Use the double stick tape to adhere the construction paper around the container. 6. Cut a strip about 2″ wide out of the black construction paper. 7. Cut a 4″ square out of the gray or yellow construction paper. 8. Cut a rectangle in the middle of the gray construction paper about 1 1/4″ x 2″. Discard the little piece of construction paper. Hint: Fold the square into fourths and cut a square out of the middle of the folded area. Open up the square. 9. Check positioning of the black band by laying it around the hat about an inch above the brim. Cut off any excess construction paper where it meets in the back. 10. Lay the gray or yellow (buckle) over the black band as shown in the photograph. 11. Once the layout is satisfactory, tape in place. 12. Add green tortilla chips, if available, and get ready for your feast.